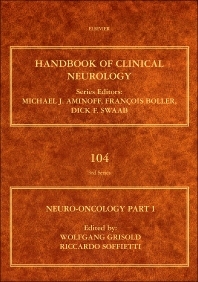 Handbook of Clinical Neurology: Neuro-Oncology, Part I summarizes the present state of scientific and clinical knowledge in the field of neuro-oncology, including information related to diagnostic techniques such as imaging, along with immunology, molecular biology, and clinical aspects of tumors. Management and new therapeutic strategies for tumors, including gene therapy and molecularly targeted treatments, are also covered. Divided into eight sections encompassing 61 chapters, the book begins with an overview of the basic principles of tumors, including the epidemiology of primary central nervous system tumors, angiogenesis and invasion in cancer, the link between blood-brain barrier and brain edema, and the role of stem cells in gliomas. It proceeds with a discussion of diagnostic tools such as neuroimaging, the principles of tumor therapy such as radiotherapy and immunotherapy, and clinical trials in neuro-oncology. The reader is also introduced to specific tumor types such as low-grade gliomas, anaplastic astrocytomas, and medulloblastoma and primitive neuroectodermal tumors, along with rare brain tumors like neurofibromatosis and other genetic syndromes. Furthermore, the book explains the neurological complications of systemic cancer and complications from treatments. This volume will appeal to clinicians and neuroscientists as well as researchers who want to gain a better understanding of the clinical features and management of the neurological manifestations of tumors. Department of Neuroscience, Neuro-Oncology, University of Torino, Italy.